As the EU prepares its next wad of cash to save Greece from financial collapse, Germans, the main sponsors of the bailout, question why they continue working to pay for Athens' – and others’ - mistakes. Meanwhile, European leaders have approved the next payment in its bailout for Athens, bidding to save the country and euro from a default. But those who are to pay the price of the new aid package could soon take to the streets. Top German lawyer Markus Kerber is suing the German government to stop it bailing out bankrupt neighbors. 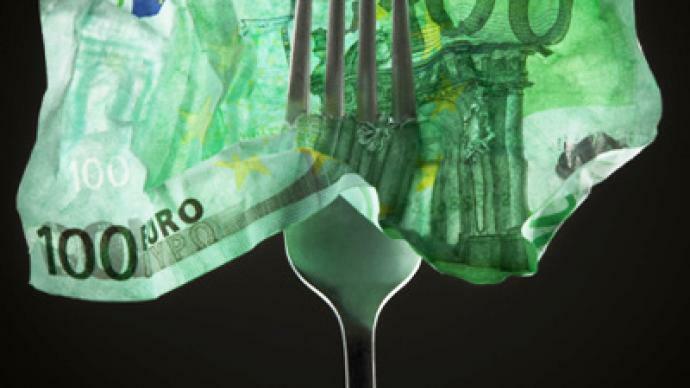 The nations labeled in derision by some as the PIIGS of Europe – Portugal, Ireland, Italy, Greece and Spain – must drop the currency now, before they drag down other members, warns Kerber. 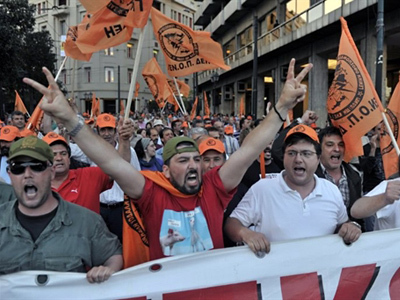 Although Athens last year raised the pension age to 65 and curbed early retirement, other European countries believe that Greek workers work less. German Chancellor Angela Merkel said the country should not expect to take frequent holidays and retire early and then wait for Germany to bail them out. The statement caused uproar in Greece, but they are not happy in the EU's cash capital Frankfurt either, believing the Greeks have had it too easy. “Of course if we’re going to work until 67, it's not possible to declare why other people should go with 60 or 59,” says one Frankfurter. “We're just certainly not responsible for the debts and the deficit run in Portugal, Greece, in the PIGS states,” says another. “Raise the age when the Greek people retire. Sorry all Greek people, but we have to work long as well,” adds a third. Market analyst and author Michael Mross, is among the experts who say Germans are at boiling point – anger which could spill out on to the streets. “If the problems of the euro become more and more, bigger and bigger, higher and higher, it's not excluded [that] German people [will] go on street and say we don't want to pay any more,” he warns. The powerful Greens are now suing Merkel's government, claiming it hid facts about bailouts from the public. “People in Germany ask do we have to pay this, so we have to give answers and the answers we don’t get from our government,” says the chairman of the Bavarian Green party, Dieter Janecek. Even the ruling party is revolting. Christian Democrat MP Klaus-Peter Willsch is fighting all rescue packages, since he argues leaving the eurozone is in the interests of the struggling countries. “They should take the chance to say 'we get out, we solve our problems, we will have our debt restructured those who gave money for high interest rate will lose some of the money, and then they can qualify again for the euro maybe after 10-15 years,’” he says. 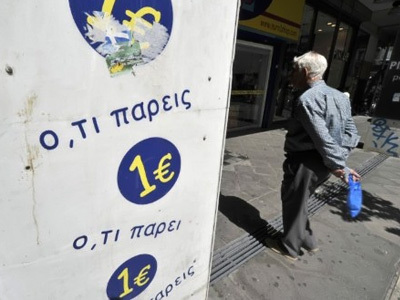 Other experts say the entire Greek bailout exercise is a lost cause – an effort in economic surgery that is doomed to failure because the illness is already terminal. Greece protests that the euro is a straitjacket that blocks traditional ways to boost the economy, like devaluing the currency or adjusting interest rates. Even Greece's European Commissioner says that the country's membership of the common currency is at risk unless Athens takes the painful cost-cutting medicine prescribed by the EU and the IMF. 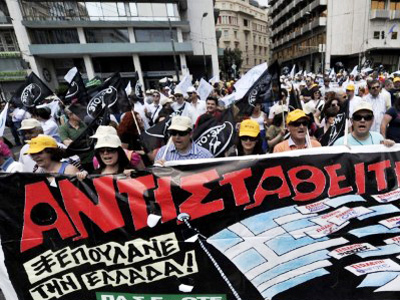 Greeks now agree with Germans who say their debt is out of control. 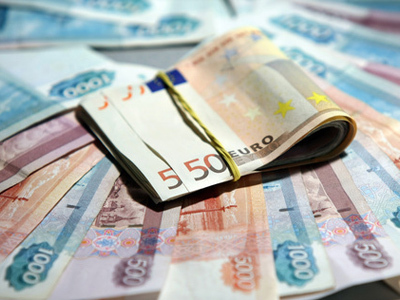 The question is, will weak states quit the euro and re-organize, or stay, and bring the single currency down with them.